Oh lovely decor8 readers, what a busy month September was! It's Rincy again and I'm back with another Simple Times column for you. It's so nice to see October start at a bit more calmer pace (hope the same for you too!). With Holly's joyous news of having a baby boy fresh on my mind and no doubt millions of pieces of advice at the ready for her, I thought to sway away from the world of the internet and go straight to the little experts themselves to see what they love and what's important. 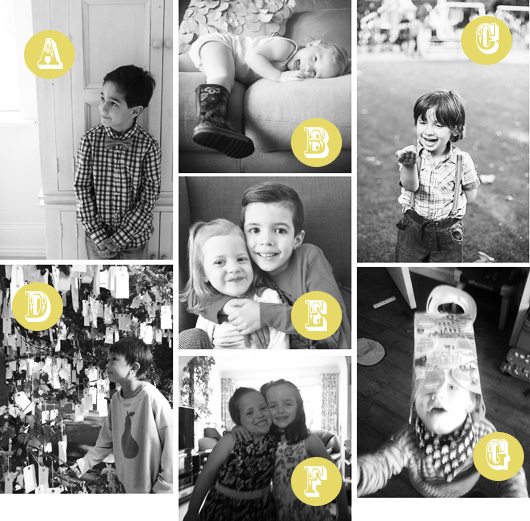 I asked a few friends and fellow bloggers to share in responses to some simple questions posed to their little ones about life, love and laughter. Here are their very dear responses which remind us all that the simple things are what we enjoyed as children - why not focus on being content as adults too? D. Geraldine's son Michael, age 7 On the best thing in the world right now: My family On what makes a good mommy: A mommy that loves you, plays with you and is generous to you. E. Bridgee's children Nick and Charlie On parenting style: They should always be funny and nice and when their kids are doing something wrong they should only be a little mad but still love them. Also, sometimes they need to say no! Nick, on why people look at him when being silly in public places: Well mom, maybe because I am so handsome! F. Lucy and Jessie (twins), age 6 On the important stuff: You can't tell Santa or McDonalds what toy to give us! If I could bottle up all the things I overhear at work on a daily basis as a pediatric registrar, I would. Children are undeniably astute and creatively inspiring-- how do you all document your children/nephews/cousins/little ones moment's of glory? I'd love if you'd share some quotes and stories here below! There really is nothing better or sweeter than a point of view from a little one's mouth. A huge and warm thank you to Pauline, Ruth, Nathalie, Bridgee, Imen, Holly M. and Geraldine for allowing me to share this with the world! And to sweet Holly Becker, we are so excited for your little muffin to enter this world-- who undoubtedly will be gorgeously sweet, inspiring and talented with an unparalleled sense of design.